There´s no other place in the world that concentrates the literary and artistic level that Las Letras neighborhood reunites. The neighborhood gets its name because it has been home to the most important writers of the Golden Age of the Spanish literature such as Lope de Vega, Calderón de la Barca, Góngora, Bécquer, Echegaray and Cervantes among others. 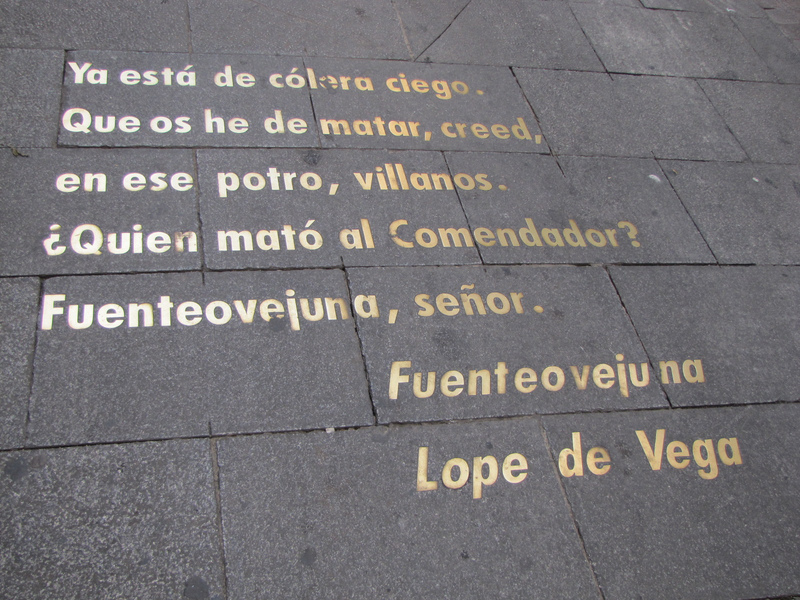 Literary quotes of their best works decorate the streets in golden letters. The Muses neighborhood (name with which Las Letras Neighborhood it´s also known) has many particularities that makes it different from the rest of the capital, in this post we will try to highlight its main places of interest. We will start our walk in the Plaza de Santa Ana, situated in the heart of this neighborhood. 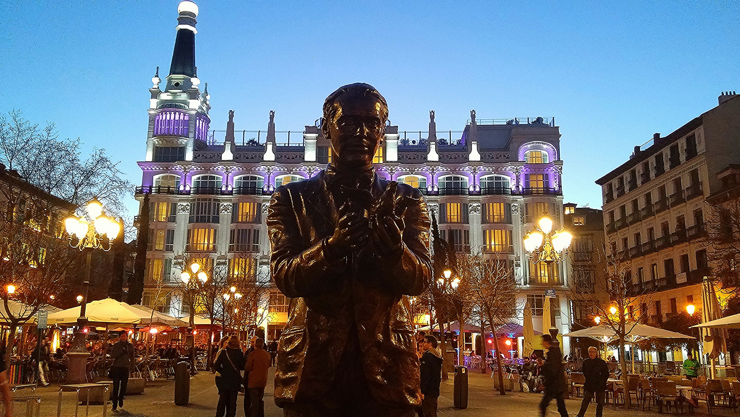 In the center of this square we find the statues of Federico Garcia Lorca and Calderón de la Barca welcoming us. 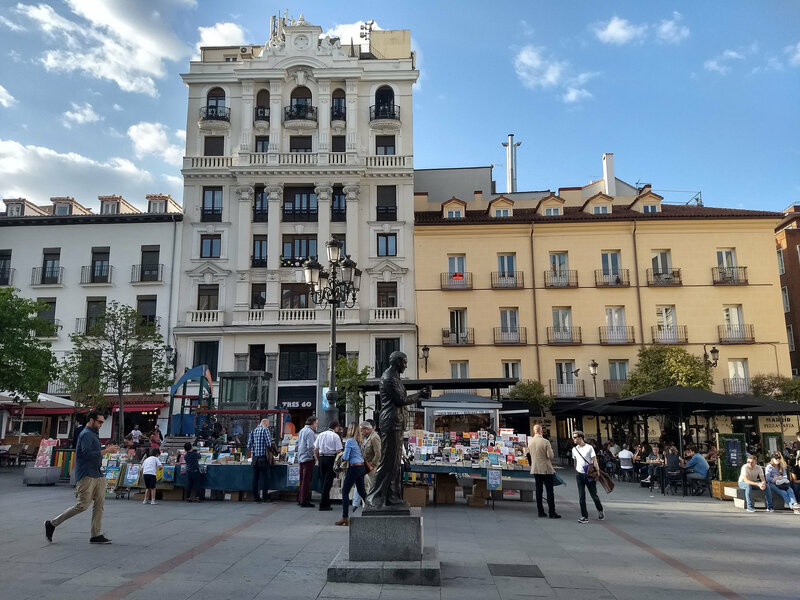 This square is a meeting point for friends where you can enjoy lively terraces and a special atmosphere with a traditional touch in which to feel like an authentic “Madrileño”. At short walking distance to the west we find the Plaza del Ángel, named after a beautiful painting of the Holy Guardian Angel that was hung in the convent of San Felipe Neri that occupied this square at the beginning of the 19th Century. In this square we find Café Central, one of Madrid´s classics, where you can have a drink while listening to live jazz. Very close to this square is worth visiting El Jardín del Ángel, one of the most spectacular flower shops in the city. Entering this little paradise is a delight for the senses that will not leave you indifferent. 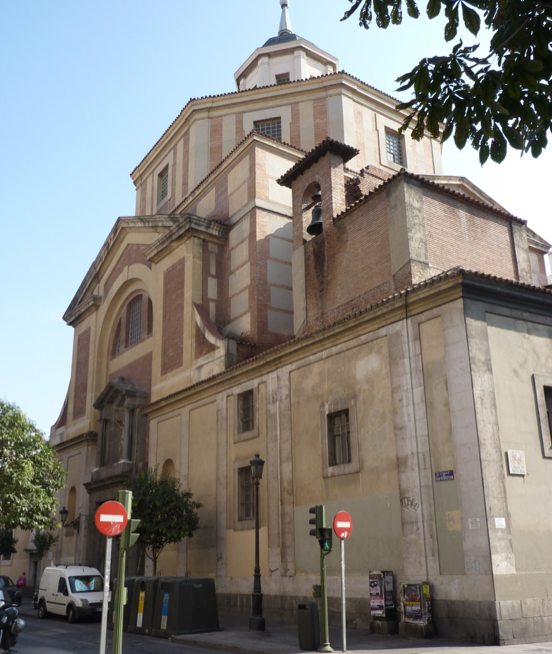 Returning to the street of our hotel, Atocha Street, we find the Church of San Sebastian. A church with a very rich history since Bécquer was married there, Tirso de Molina was baptized and it is also where Lope de Vega has been buried. Continuing with our walk we arrive to one of the most cheerful streets in the neighborhood, Huertas Street. This street is full of animated bars and restaurants where you can have a great time. Parallel to Huertas Street we find Lope de Vega Street, which is a mandatory stop to visit the Convent of the Trinitarias Descalzas of San Idelfonso where Cervantes is buried. Very close to here is Cervantes Street where we can end our tour visiting the Lope de Vega House Museum.